This drink has two big cocktail firsts for me: sloe gin and a liquid mysteriously referred to as aquafaba. On the surface, it's a Sloe Gin Fizz with the rich addition of Japanese whisky. As you peel away the layers, you'll find it to be bursting with jam and spice flavors with a hint of savory notes and balanced sweetness. 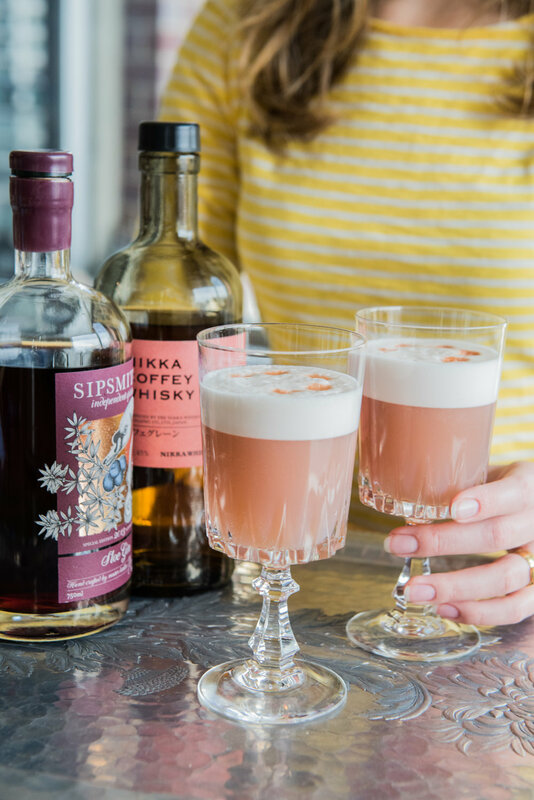 This Sloe Gin Fiz is also vegan, thanks to the aquafaba being used as a substitute for egg whites. To talk about the Sloe Gin Fizz, we need to back up and define sloe gin. Have you had it before? Or rather, have you had a good one before? If not, you really need to get your hands on some. Sloe gin dates back as far as the 17th century in the UK, when blackthorn hedges started being used to break up the land. The hedges yielded tart, plum-like berries that countryside folk steeped in alcohol and enjoyed as a wintertime treat after the autumn harvest. As sloe gin became more popular recently, many producers used added flavor rather than the actual berries to give sloe gin its distinctive color and taste. I first discovered the liqueur through Sipsmith, so my standards were set high. Their take on sloe gin is made by infusing London Dry Gin with sloe berries picked in autumn and is absolutely delicious both on its own and in cocktails. The flavor is comparable to a black currant liqueur but not as sugary and with more spice and tartness. It's my absolute favorite liqueur to sip on the rocks by the fire after I come home on a cold winter day. I wanted to give this cocktail more body for the coming of fall, so I chose to use Japanese whisky, rather than gin, for the base spirit. The Coffey Grain Whisky, by Nikka served me very well in this application. Distilled primarily from corn in Scottish Coffey stills imported to Japan in the ‘60s, this whisky is naturally sweet yet bold, with vibrant notes of spice and fruit. It balanced the sloe gin wonderfully with each ingredient shining through in the final cocktail. Now that I have you hooked with two delicious spirits, it’s time to get a little weird. What, you ask, is aquafaba? It’s nothing more than a fancy name given to the liquid in a can of chickpeas to make it sound less scary. So yes, it’s essentially bean water, but look how beautiful it looks topping that lovely drink! If you avoid egg whites because you’re concerned about potential for bacteria, you’re vegan, or the smell bugs you, aquafaba is a great alternative for foam. I’d recommend using it in bolder cocktails, but it doesn’t have a strong flavor or smell. It’s important to choose a can with either no, or very minimal salt as that may interfere with the flavor of your cocktail. The preparation is similar as to what you’d do with an egg white cocktail - dry shake all of the ingredients with aquafaba to form the foam, then add ice and shake until chilled. I added a healthy bit of lemon to give the drink a sour finish, and then formed the rich foam with the help of club soda. 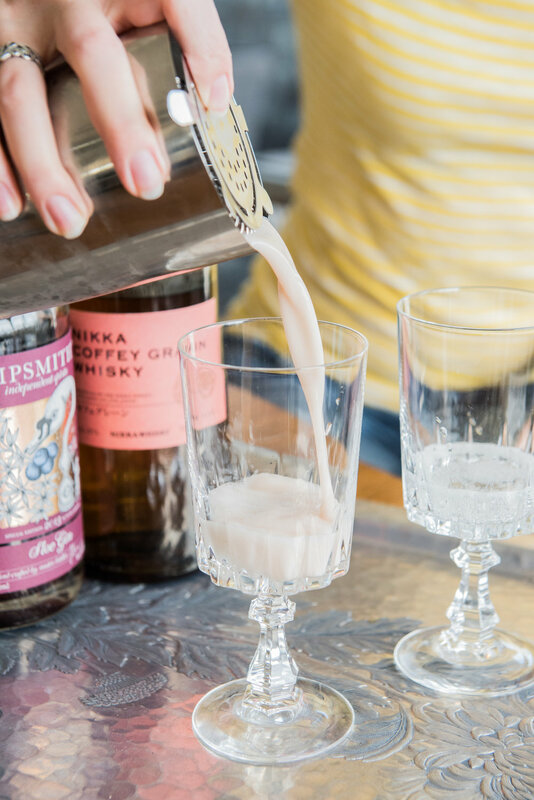 The secret to getting the most (and the most flawless) foam is to add the club soda to the glass first, and then pour all of the other ingredients from the shaker on top. As the foam from the shaker comes into contact with the club soda, it’ll continue to build and fluff out. If you’re feeling especially adventurous, you absolutely must try your hand at bitters art. As long as you have a fairly sturdy foundation of foam and a good dropper bottle for your bitters, it’s totally attainable. I used Angostura Bitters for the extra spice and pop of color but poured some into a small dropper bottle so I’d have more control. Make sure you have a fine-point tool like a toothpick or a cocktail pick to finish the design. Once you have everything ready, place 5 drops in an incomplete circle on the surface of the foam. Then, use your fine-point tool to gently trace the shape of the circle through the middle of each dot, forming a trailing heart shape. Don’t be discouraged if it doesn’t work the first few times - it’s just an excuse to have more cocktails! The resulting drink is lovely to look at, creamy and satisfying while also wakening your taste buds with a delightful bouquet of jammy fruit, spice and tartness. Add all ingredients other than club soda and bitters to a shaker and dry shake for 10-15 seconds to form the foam. Add ice and shake until chilled. Pour club soda into glass. Strain liquid from shaker slowly into glass over club soda, allowing foam to build. Top with several drops of bitters (instructions for bitters art shown above). Enjoy while escaping the first chill of fall for profound, cozy conversations with friends.